The more narrowly you can define your current customers, the better you can address their needs, drive repeat sales, and find more of them! Without this knowledge, you're essentially running your business and marketing strategy blindly. Your web developer or marketing consultant should have set up a Google Analytics account at the time of your website launch. If not, you'll want to loop both these teams in to create your free account. The tool is primarily used to analyze your overall website's performance, but using the wealth of knowledge allows you to uncover key information about your customers (that you don't need to ask them for!). Using the following Google Analytics features, create a target customer (persona) profile which will steer the direction of your social media posts, blogs, keywords, email strategy, and more. Once your account has been verified and you've been tracking data for a few months, take a look at your In-Market Segments. 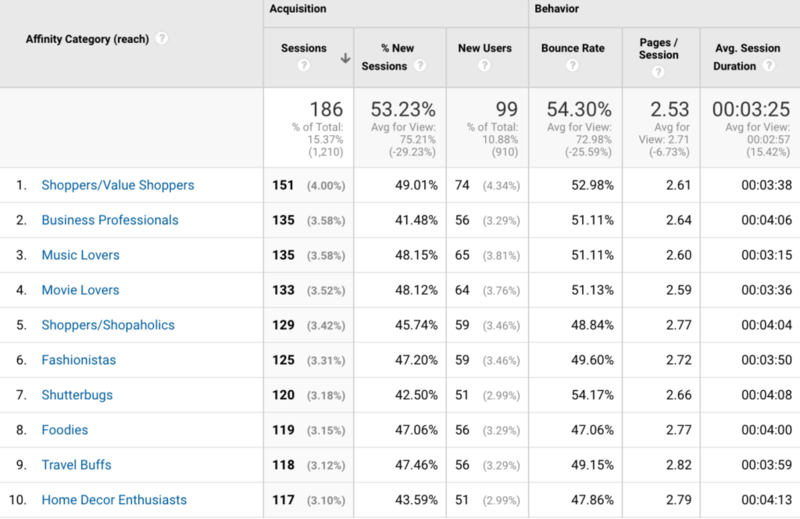 This is a report that classifies your site visitors based on their browsing behaviour on other sites. You can access it by navigating to Audience > Interests > In-Market Segments. Make sure you've expanded your date range to 6-12 months to ensure you're getting a good variety of visitor data. Understanding what types of sites your current visitors look at allows you to start creating an accurate profile of their interests and potentially job details. In the same "Interests" segment you can gather more category details from your visitors. These categories are created by Google and should be used to complement the data you gathered from your In-Market Segments. This report lives just above the previously mentioned one: Audience > Interests > Affinity Categories. BONUS: Use the information you gathered from the Affinity Categories and In-market Segments in your Google AdWords campaigns! You can use these categories to define who you want to see your ads. The demographics report can show you the age range of your visitors and their gender. Using these details, you can craft your strategy more accurately. PRO TIP: For an even more effective marketing strategy, create separate advertising campaigns based on your visitors and customer's demographics. For example, create 2 different campaigns for males and females, or separate ads based on age. Both parties will have unique pain points and challenges so avoid lumping everyone together! Sometimes businesses are surprised to see which countries the majority of their traffic comes from. This information is particularly useful for businesses that do not operate in some countries or can't ship across the border. Take a look at your report at Audience > Geo > Location. You may find that you need to tweak the copy on your site or your overall SEO strategy. 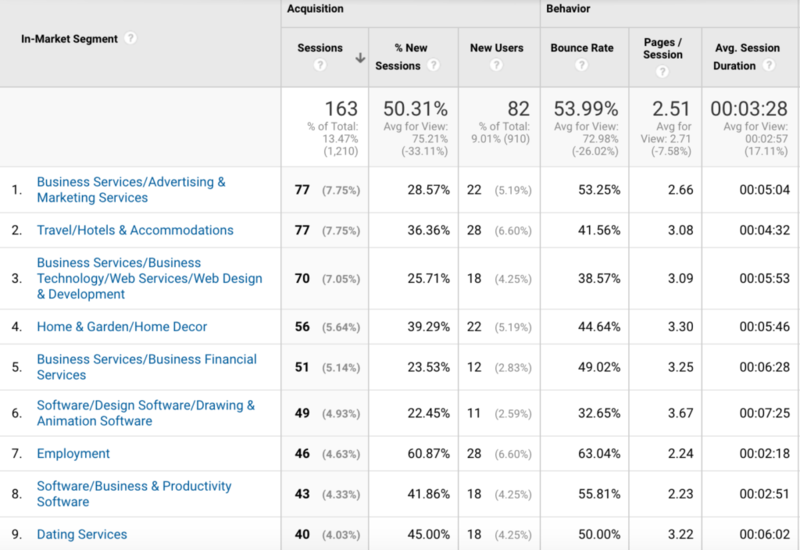 If you're not familiar with Google Analytics, it can be overwhelming. But it doesn't need to be! Once you learn the basics, it should become a tool you use for an hour a week to check in on your website performance and uncover any new opportunities to improve your rank or user experience. Need some help with setting up or analyzing your Google Analytics? I'd love to help!